The villa designed by Palladio for the brothers Nicolò and Alvise Foscari around the end of the 50's rises as an isolated block and lacking agricultural appurtenances at the border of the Lagoon on the side of the river Brenta. More than a villa used for farming purposes, this was a suburban residence that could easily be reached by boat from the centre of Venice. 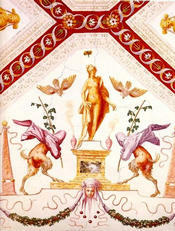 The family of its patron was one of the most powerful families of the city. And it was so that the residence was provided with majestic features, almost regal features, unknown to all the other villas of Palladio, which is enhanced by the splendid interior decorations by Battista Franco and Gian Battista Zelotti. The villa rises on a high basement that separates the first or 'noble' floor from the damp ground, augmenting the magnificence of the building that is lifted up as though on a podium, like an ancient temple. 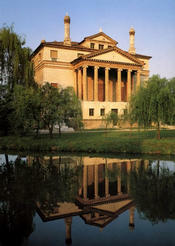 The villa sees the coexistence of motifs that recall the building traditions of the Lagoon while also evoking ancient architecture: like in Venice, the main façade is turned to the water, but the model for the pronaos and the large stairways is definitely the small temple at the mouth of the Clitumno which was well known to Palladio. The majestic twin access ramps forced visitors to walk along a ceremonial pathway: having approached the front of the building they would ascend to meet the owner who awaited them at the centre of the pronaos. The solution traditionally adopted by Palladio to present stiff sides to the jutting proanos is set aside in order to provide access to the stairways. The villa provides especially effective evidence of the ability of Palladio to achieve monumental effects while using poor materials, basically brick and plaster. The degradation of the surfaces clearly shows that the villa is built in brick, including the columns (with the exception of the elements that are more easily derived from stone, including the bases and capitals), with a marble-effect plaster that imitates the effect of a stone surface with an ashlar effect, similar to what used to at times be visible on the naos of the ancient temples. The rear façade is one of the most successful examples of Palladio's work: a system of gaps makes the interior plan visible; think of the vaulted wall of the central hall that is almost see-through thanks to the thermal glass panel overlapping a three-light window.